About Us - The Creed of Sigma Nu Fraternity - Sigma Nu Fraternity, Inc. The Creed defines what Knights in the Legion of Honor stand for and was written by Walter J. Sears (Nu - Kansas). 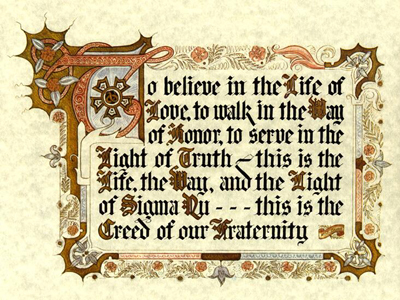 The preamble to The Creed is considered a historical document of the Fraternity. While it is not a part of the official Creed of Sigma Nu, it touches upon themes of how the values of Sigma Nu display themselves in action. TO BELIEVE IN THE LIFE OF LOVE; to win in the fresh morning of our youth the loyal love of faithful friends, who will go with us unmoved into the darkening shadows of life's closing day; and so to seek and to find, to have and to hold the friendships that will abide. To think of God as the common Father of all men, and all men as a common brotherhood, thus recognizing the continuity of the Divine and the solidarity of the human life. To build somewhere in the wide world the sheltering walls of a home, however humble and obscure, where Love shall glorify the wife, Duty enshrine the mother, and Affection ennoble the child. To keep green the sainted memory of our loved and lost, their faults forgotten, their virtues enshrined in our hearts forever. To try bravely to do unto our fellow men as would they do unto us, reckoning not their lineage nor their wealth, but esteeming their manhood above their badge of rank. To let our lives be led by the spirits of Gentleness, Justice and Mercy. And so to be true to the Knighthood of Love. TO WALK IN THE WAY OF HONOR; to exalt the fundamental virtues of the race; and, prizing every noble impulse, to realize so deeply the baseness of deceit, that no obligation will be more binding than our plighted word. To be steadfast in the performance of every trust, and, spurning the gaudy gifts of greed and power, to be content to live by our knightly vow that our honor is dearer to us than our lives; and so to esteem the man's character first, his culture second, and his pedigree not at all, unless he be worthy of it. Emulating the chivalrous deeds of courtesy, and sealing not our hearts against the touch of tenderness, to win the love and care of some incorruptible woman. And so to be loyal to the Knighthood of Honor. TO SERVE IN THE LIGHT OF TRUTH; to open wide, Life's windows to the revelations of heaven and earth. Avoiding the Phariseeism that belittles the soul and scorning the bigotry that blights the mind, to respect every altar of faith built in God's name, by every sincere worshiper to whom, if we cannot give our sympathy, we shall not deny the kindness of our manly silence; and, whatever our creed, to reverence the Christ as the Divine Compassion for struggling humanity -- a compassion that, giving the world its gospel of human service, saves men to the end that they may serve their fellowmen. To seek in nature, the meaning of the Infinite Truth; to understand that the laws of growth are the laws of God; to believe that the melody of birds, the laughter of children, the unmeasured sacrifice of motherhood, and the ceaseless yearning of all men for a wider outlook and a nobler existence are prophetic of the perfect joy and love of another world; and, so believing, to find rest, as in the shadow of a great rock, against all the storms that beset us; catching from the silence of the starlit nights, the peace of the autumn days, the solemnity of the boundless seas, that spirit of Hope and Faith which soothes the hurt of grief, heals the wound of wrong, and calms the fever of doubt. To guard with jealous care not only ancient rights of human freedom, in whose name we shall destroy all wrong and oppression, but also the newer rights of social service, the ultimate purpose of whose ministrations shall be to give to every life, the opportunity to enjoy the earth in the fullness of its beauty and grace, its comfort and good cheer; holding fast to the conviction that whatever sweetens our natures, uplifts our ideals, strengthens our characters and disenthralls our spirits, will bring us in the end into the full stature of a noble manhood; and, so inspired, to cling to the visions of our youth, and, despite the sordid struggles of the selfish world, to practice every day, as lads in college, and men in the world, the Faith of our Fraternity, thinking of it not only as the inspiring Ideal of a militant Brotherhood, but also as creative force for the spiritual development of men, whose lives it shall dedicate to Love, glorify with Honor, and conquer for Truth. And so to be faithful to the Knighthood of Truth. This is the Life, the Way, and the Light of Sigma Nu.